In some circles, the question of what can truly be considered ultimate all-round car comes down to two choices. The classic 911 and the e30. I am here to give a brief comparison of both. The e30 was the third iteration down from BMW's successful 2002/1600 platform. First setting foot on American shores in 1984, the e30 came with a choice of 2 standard power plants. Either the m10b18, a 1.8L, fuel injected four cylinder engine in the 318i, or the m20b27, a 2.7L, fuel injected straight six found in the 325e. Neither of these engines were great powerhouses,the m10 managed to make about 110 hp, but they worked well with the cars they were in. The m10's block was derived from BMW's formula 1 efforts, and the 325e made 180 lb.ft. of torque, despite only being able to rev to a diesel-like 4250 rpm. Later, the wonderful m20b25 engines became available in the 325i. This was a high revving 2.5L, fuel injected straight six, making about 170 hp, but was down on torque from the m20b27, with only about 159 lb.ft. on tap. To drive a 325i is to have a smile plastered to your face. Everything from the feel of the steering, to the sound of the engine,and even stepping out and looking at the quirky, yet handsome styling. Everything about them just felt right. 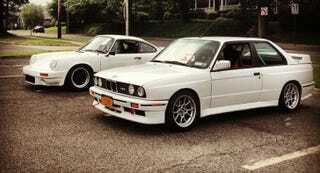 Then, the e30 m3 was born, and with it the s14. A four cylinder engine that revved to the stratosphere while making grown adults weep as they watched the flare-fendered rally homologation tear down dirt roads and twisty tarmac. Despite being a child of the 80's, the e30 was not self destructive or highly complex. It worked every day, and would take the beatings of 3rd and 4th owners with only minor complaints from the cooling system. It was just complicated enough to make it a reliable workhorse compared to most of the vacuum hose ridden malaise of the time, but just simple enough that almost anyone could figure out how to work on it. The e30 could do anything you asked it to. It even came in wagon trim, albeit not to the U.S. The Porsche 911 began its life in 1963 and soldiered on, well into the 1980s, although with a plethora of model designations and engine changes. The contemporary iteration of the 911 came in two main variants; the Carrera and the turbo, also known as the 930. The Carrera was blessed with a fuel injected version of Porsche's air-cooled flat-six, with a gargantuan 3.2L displacement. In the U.S. this translated to 207 horsepower. This car was manageable, but fun to drive, even every day. It was a joy to be in. Everything about it speaks to the driver. The sound of the flat-six was mechanical, not beautiful in all ways, but satisfying and instantly recognizable. The 930 was a very different beast. Wider and wilder, with the unforgettable slant nose version (based on the 935 race car) being the least recognizable as a 911. A 3.3L, air cooled, turbocharged flat-six, making 300 horsepower made the 930 an absolute monster to drive. It is remembered as a vehicle to be tamed, more than driven. The nature of the power delivery, coupled with the rear-engine mounting, made for an challenging, but rewarding endeavor for those with the talent and patience to master driving it. For the less fortunate, it served as their grave. Driving the 930 goes a bit like this; foot goes down, nothing happens for a while, then all of a sudden you are in the next state. Being surprised by the power delivery mid-corner meant instant power slides with little hope of catching them once the heavy rear-end started to come around. It was fast. Very fast. The e30 may not be as storied, powerful, or prestigeous, as the 911, but it hits all the right keys in perfect harmony. The 911 is a legend, beyond reproach. But the 911 requires time. It requires patience. It requires money. Effort. Skill. It requires a lot, is what I'm saying.The e30 is by comparison a simple hand shovel, for planting the seeds of the hoontree. And from that seed can grow any type of hoon you like.Drag racing hoons. Beater car driving hoons. Road racing hoons. Autocrossing hoons. Drifting hoons. Hoons that race from light to light. Hoons that can drive only sideways. Hoons that swap. Hoons that boost. Hoons that meticulously shine their wheels and tires as if a car show might break out at any second. The 911 does not breed such things, at least not at my pay grade. The 911 will get you there, fast. But it is like tending a rose bush; prickly, a bit delicate in some ways, but robust and strong in others, beautiful to observe, but maybe a bit less useful practically. The e30 stands as a tree, firm in its roots,and bearing fruit through its life. If there was one car left on Earth, I pray God its name be e30.